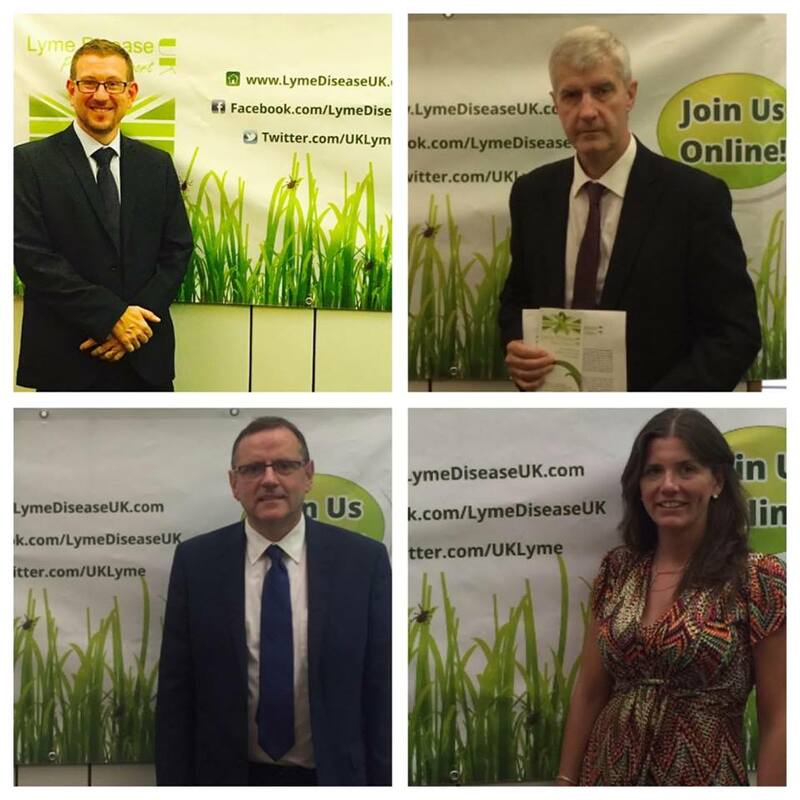 MPs gathered in Room T, Portcullis House on 6th September 2016 for the drop-in meeting to meet Lyme disease sufferers and their loved ones to discuss the very important issues of Lyme disease testing, diagnosis and treatment. It was a chance for LDUK members to share their personal stories and for MPs to assess how they can help to push for much needed change. We look forward to updating you on progress resulting from from this meeting and we would like to thank Teresa Pearce MP and her constituent Deb Collins for organising the meeting. We would also like to thank all the MPs who dropped in and all the patients and carers who attended. Thank you as well everyone who worked hard behind the scenes to pull off this event at such short notice. 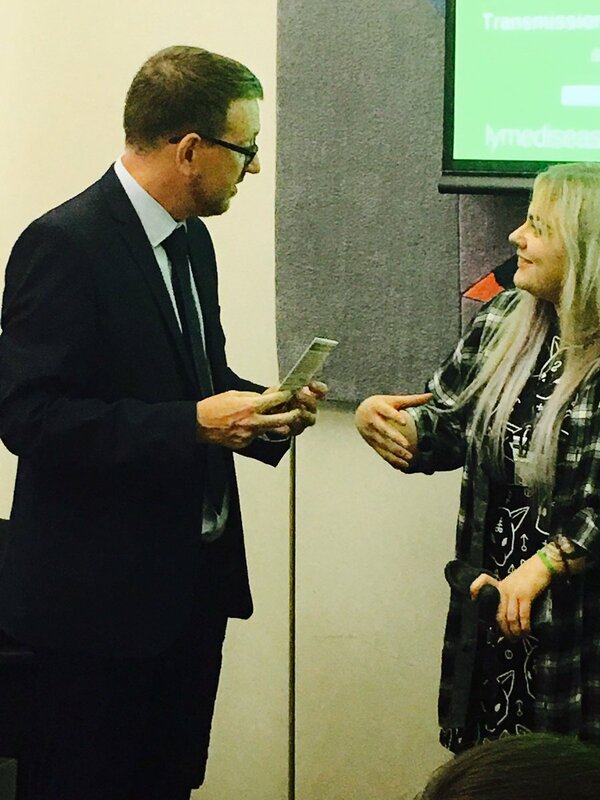 Let’s hope for more meetings like this as awareness of Lyme disease continues to grow. MPs were given LDUK leaflets, tick awareness cards and a handout. ‘Lady Mar has long been an advocate for ME and Lyme disease patients and she kindly attended the drop-in meeting to show support and engage in conversation. Over 30 MPs and several assistants of those MPs who could not come visited during the two hours that we were allocated. 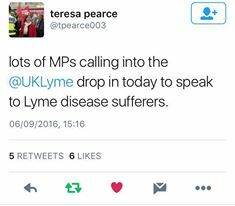 Many said they have constituents with Lyme, or know someone who suffers from it. 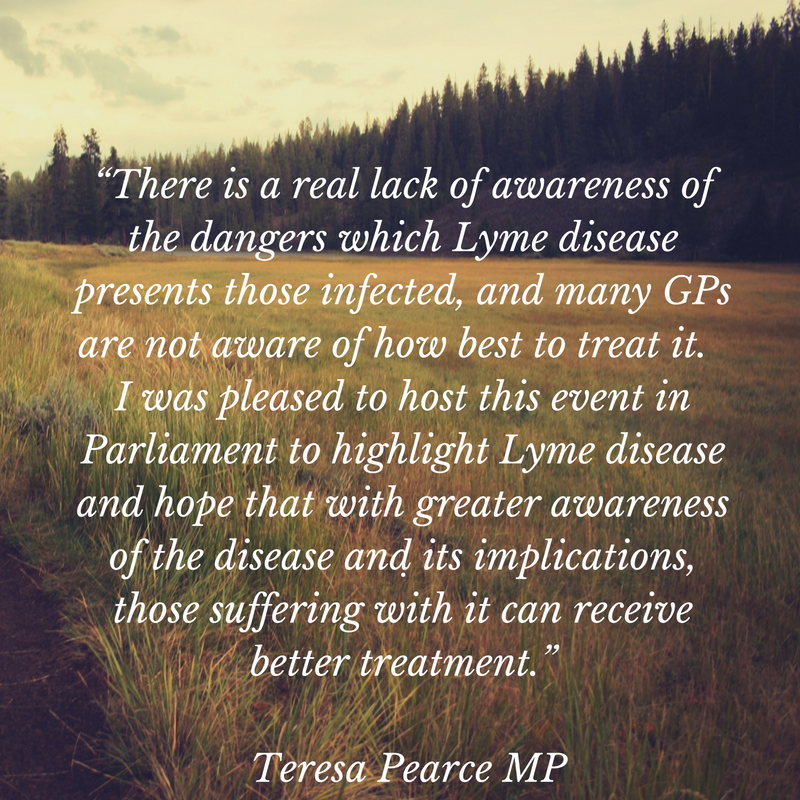 1) To enlist the help of MPs to form a cross-party group in order to work together to change current, dire situation Lyme disease patients find themselves in. 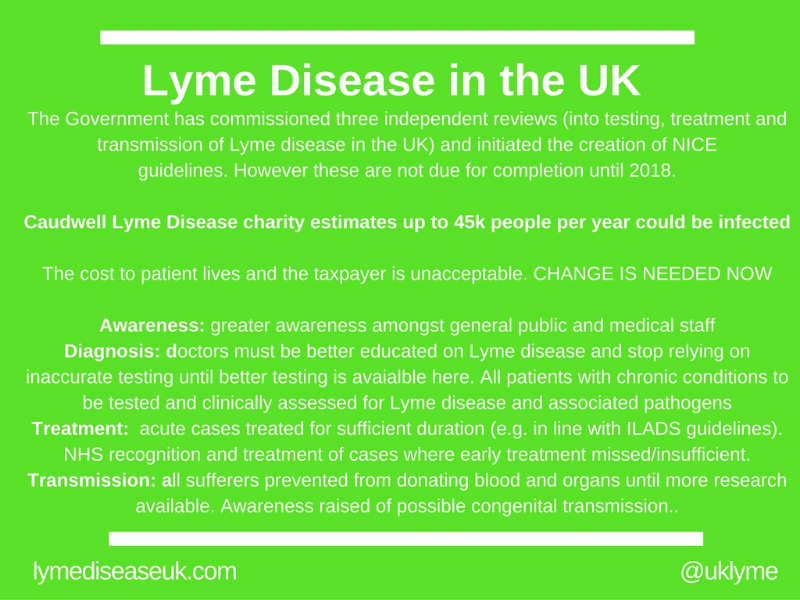 2)Tackle doctors’ lack of awareness and training as well as the issue of unreliable testing methods and reluctance to make clinical diagnoses of Lyme disease. 3) Push for long term treatment in line with the ILADS guidelines to reduce the chance of chronic illness. 4) To raise awareness and encourage the general public to check for ticks – warning signs in recreational areas, education programs in schools etc. 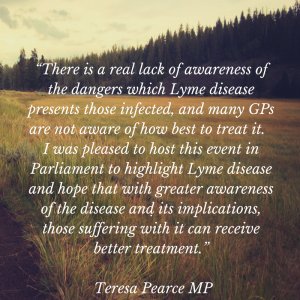 The drop-in proved to be an excellent first platform from which to inform our MPs further of the problems encountered and the difficult lives of those suffering from Lyme and to ask for their assistance in changing the status quo. « Chris Packham and Big Tick Project in Wimbledon!